When Logan and I found out we were having a baby, we could hardly contain ourselves! 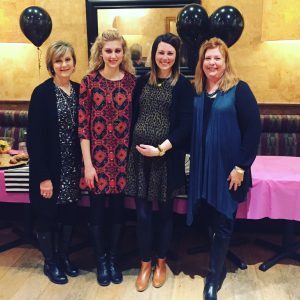 We couldn’t wait to share the news with our families and friends, and immediately started brainstorming some fun ways to share the big news! The first to find out were the dogs (of course). 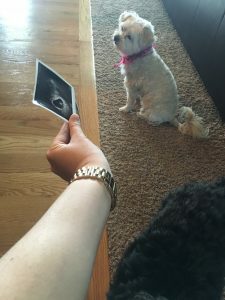 We showed them the ultrasound picture as soon as we got home from the first appointment and one was definitely more excited than the other. And then we made them pose with the picture … poor dogs. The first humans to find out were the grandmas and grandpas! 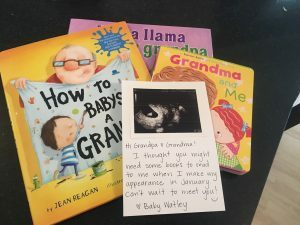 For my parents, we purchased some children’s books about grandmas and grandpas (my mom is an elementary teacher, too) and wrote a note to them from the baby. 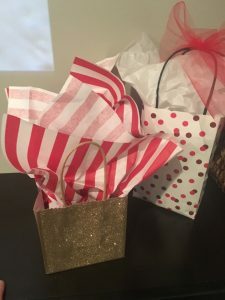 We were celebrating birthdays that weekend and it was right around Father’s Day when we told them, so a present didn’t seem out of the ordinary. My mom immediately “got it” and started crying, but my dad took a little bit longer. Finally, after what seemed like minutes later he said, “Wait, are you pregnant?” Haha, gotta love dads! Logan’s parents were already grandparents times three, so we wanted to think of a different way to tell them. 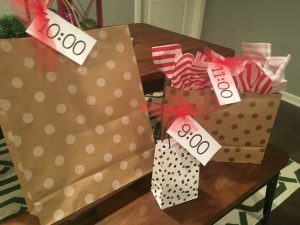 We were meeting them for dinner right around the same time, so they had birthday presents for us and we had gifts for them, too! 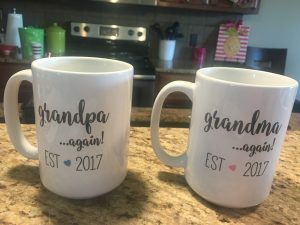 I found these cute mugs on Etsy, perfect for repeat grandparents! Next up, were our siblings. My little sister, Elena, has been bugging us for a couple years to have a baby, so we knew she’d be excited! 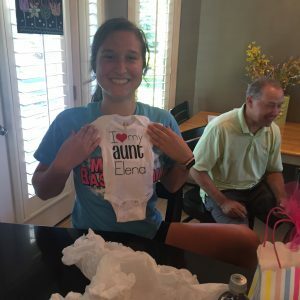 I ordered a onesie off of Etsy that said, “I (heart) my Aunt Elena” for her to unwrap. Her reaction was pretty priceless, but you’ll have to head over to our Facebook page to check out the video. A couple of weeks later, we headed down to Dallas to celebrate the engagement of Logan’s brother, Paul. 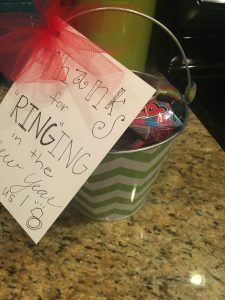 We wanted to share the news with him in person, but didn’t want to take away from his excitement, so we waited until the last night to tell him before flying out the next day. 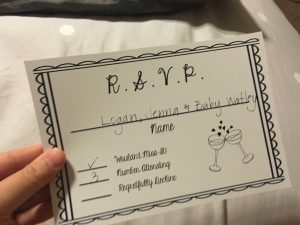 I printed off a fake wedding R.S.V.P. card and we told him and his new fiance we’d filled out our card a little early. 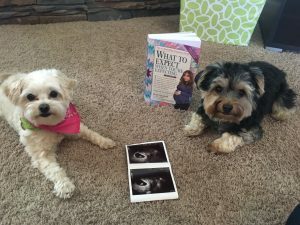 They were both very surprised and excited to know we’d have a baby in tow for the wedding! We weren’t quite as creative in telling his other two siblings, but they were very excited as well! 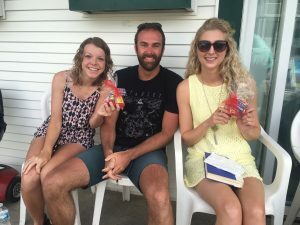 We head to Lake Okoboji every year over the 4th of July with all of my extended family who we are very close with, too, so we knew that would be the perfect time to tell them! 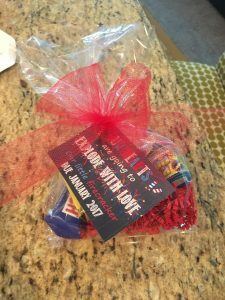 I put together some little gift bags with candy and fireworks that said, “Our hearts are going to explode with love – Our little firecracker due January 2017.” (Find the printable here) Everyone was very excited – again, the girls caught on much more quickly than the guys, but some seemed to have an idea already 🙂 We had gone out for lunch a few weeks before and instead of ordering my typical sandwich or salad, Baby was wanting a giant chicken friend steak with mashed potatoes and green beans, haha! My aunts and cousin said they had a hunch after that! 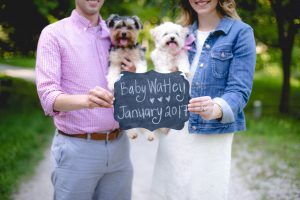 After we’d told all of the family and our close friends, it was time to share the big news on social media! 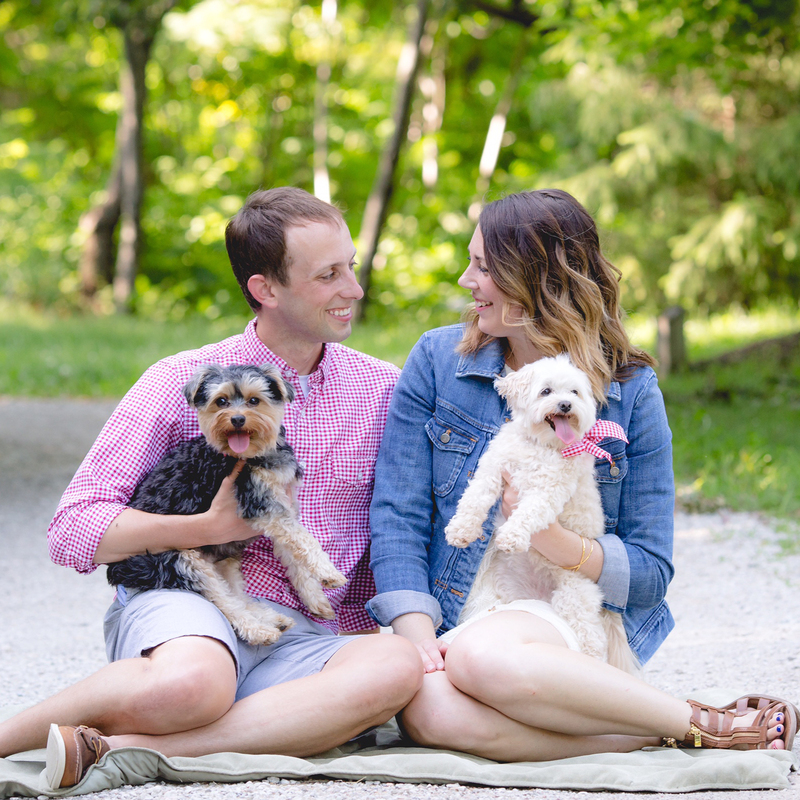 We hired Kristin Polking to take some announcement pictures with us and the dogs so that we could document this exciting time in our lives! Thanks for stopping by today! How did you share the big news with your family and friends? For me, this last week has been an un-welcomed blur. For those who don’t know, my brothers and I own a running retail store (605 Running Company) located in downtown Sioux Falls. About 200 hours ago (10:30am on Friday, December 2nd), I got a text from our assistant manager that she had felt the building shake, and a policeman came in and told her to evacuate immediately. As it turns out, a business ON OUR BLOCK had collapsed. Now if you aren’t from Sioux Falls, or haven’t visited our store, our block is made up of four buildings that are separate but connected. First National Bank is the furthest north, followed by our building (made up of a bakery, then us, then a home decor shop). Just south of us (but again, still connected) was a bar, and then on the very south part of our block, another bar that was being renovated into a Lewis Drug (think local Walgreens/CVS). Above each of these main floor businesses were additional floors housing a rental company, a lawyer or personal apartments. While information was not quick to disseminate, we eventually learned that two individuals had been trapped in the collapsed building furthest south: the former bar that was having renovation work done. Thankfully three hours later, a young woman was rescued, however, around 6pm on Friday night, the second individual, a construction worker, did not make it. OSHA is conducting an investigation that I feel will be heavily relied upon as we try to determine exactly what happened, and I’m not planning on expounding in this forum all the things I’ve heard or read about the incident. What I can say is that this tragic event also had an effect on our business; closed for seven business days during the holiday season. We were initially evacuated on Friday as gas and power lines were cut to our block while damage was assessed. We were then told all the buildings on the block were safe to occupy. Then overnight Saturday (12/3), a hole developed in the bar just south of our building. While the city assured us that our building was safe on Sunday, our landlords told us the city had indicated the building was not safe and should not be occupied until Wednesday (12/7). Then on Tuesday (12/6), we were alerted that we would not be allowed to re-enter the building for safety reasons until at least Monday (12/12). 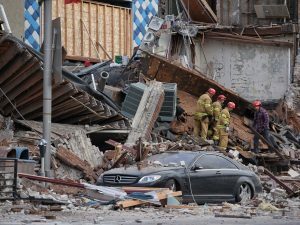 Then finally, in one bizarre turn, we were e-mailed Thursday (12/8) that the building had been certified as safe by a structural engineer and we could return immediately. In the meantime, since we had been notified Tuesday (12/6) we could not occupy the building until Monday (12/12), we decided to set-up a “pop-up shop” on Wednesday (12/7) to be open as long as needed. Of course we spent a lot of time setting-up inventory to sell, only to be told we would be able to move it all back and be open on Friday (12/9). If you are getting confused looking at all these dates and shifts in information, imagine how difficult it was for us to actually discern what was going on! Regardless, we are in our building that has been certified as safe, and happy that we can make an attempt for things to be “normal” again. 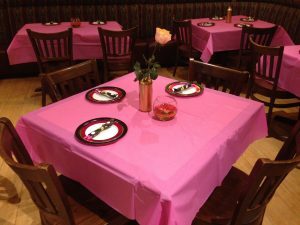 This was an extremely difficult time for us as owners, our employees and really the Sioux Falls community. It’s always tough when a life is lost, and I’m looking forward to hearing ideas from our employees on how we can continue to build community through this time. Meanwhile, if you are in need of shoes, apparel or any other running related items (or gifts), please do not hesitate to let me know. I know a good place to get some of that stuff. FYI – there are lots of news outlets to read about what happened. Here is just one. 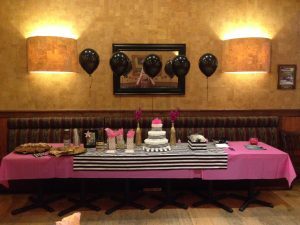 Baby and I had the most wonderful “Kate Spade” inspired shower on Sunday! 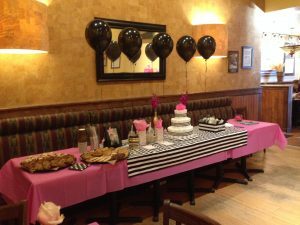 My aunts and cousin were the hostesses and did an amazing job with the decor, so I thought I better share a few pics! 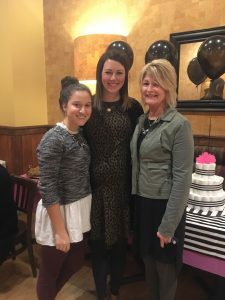 My sister and mom are very excited for Baby Girl to be here! She is so loved already! 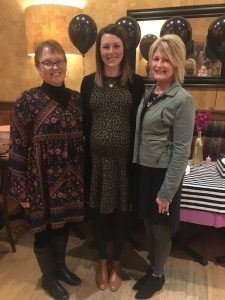 Baby will be so blessed and spoiled by these two grandmas! She will be grandbaby #4 for Logan’s mom (left) and the first for my mom (right). 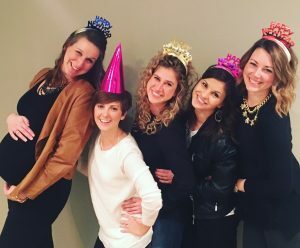 We had such a fun afternoon celebrating with friends and relatives! I will always cherish these pictures and share them with my daughter so she knows how loved she was/is, even before she was born! Thanksgiving has got to be on of my top three holidays during the year. 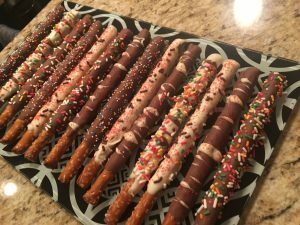 Thanksgiving, Christmas and 4th of July, in some order. Since Jenna and I got married in 2011 (and maybe even a year or two before), we spend every 4th of July in Okoboji, IA. We are always running around like crazy, trying to get in complete days full of mini-golf, nutty bars and the pool, of course. We spend Christmas split between my family on Christmas Eve and the Davies on Christmas Day. It’s great to see both families over the time, but travelling can be a little hectic. 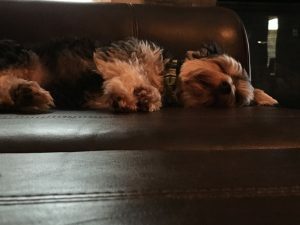 The reason Thanksgiving is near the top of my list is because it is a time where I can just relax. Whether we are spending time in Columbus or with my family in Lincoln/Ashland/Sioux Falls, I know that my expectations for activity are very low on Thanksgiving Day, and really the whole weekend. With that being said, I broke my own rule this year. Rather than enjoy the extra 2.5 days off, we spent Thursday at my parents’ new house in Ashland, Friday with Jenna’s family in Omaha, and then I flew to Dallas on Saturday to visit my brother Paul. One of my college roommates, Jarryd Widhalm, flew up from Mexico City to meet us both and celebrate his 30th birthday and my upcoming one. In the spirit of Thanksgiving weekend, we ate better (more) than I think we probably should have. On Saturday, we ate at Grub Burger Bar and watched the beginning of the Ohio State/Michigan football game. 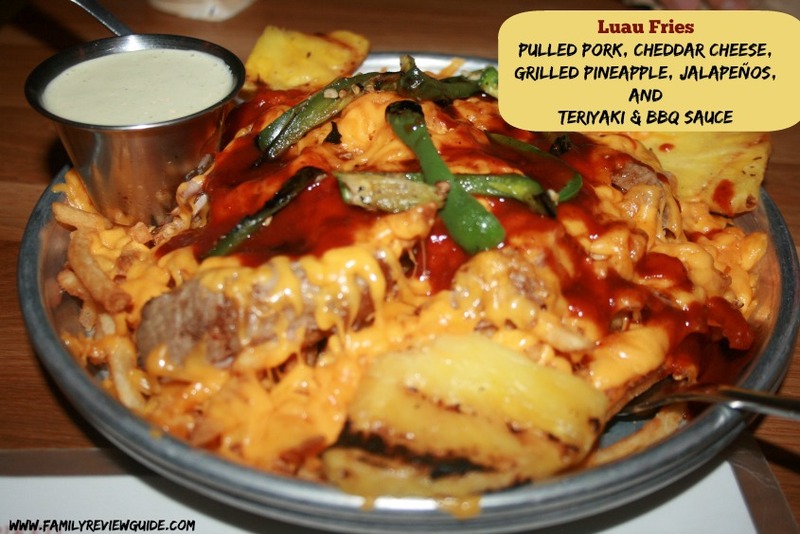 We got some Luau Fries, which were basically skinny fries covered in cheese and pork with jalapenos and BBQ sauce on the side. Those got devoured pretty quickly when we ordered our actual meal: Paul the Guacapotle burger, Jarryd the Mac ‘N Cheeseburger and me the Jive Turkey. 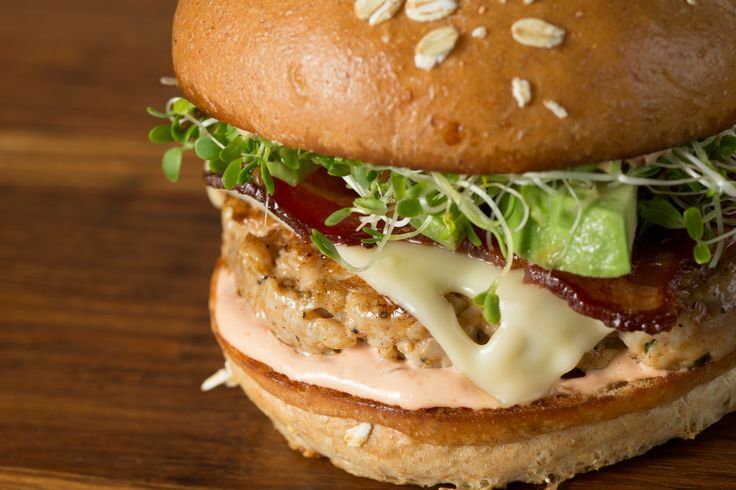 I can’t speak for the other two, but the turkey burger I ate was one of the best (right up there with one from The Cheesecake Factory). 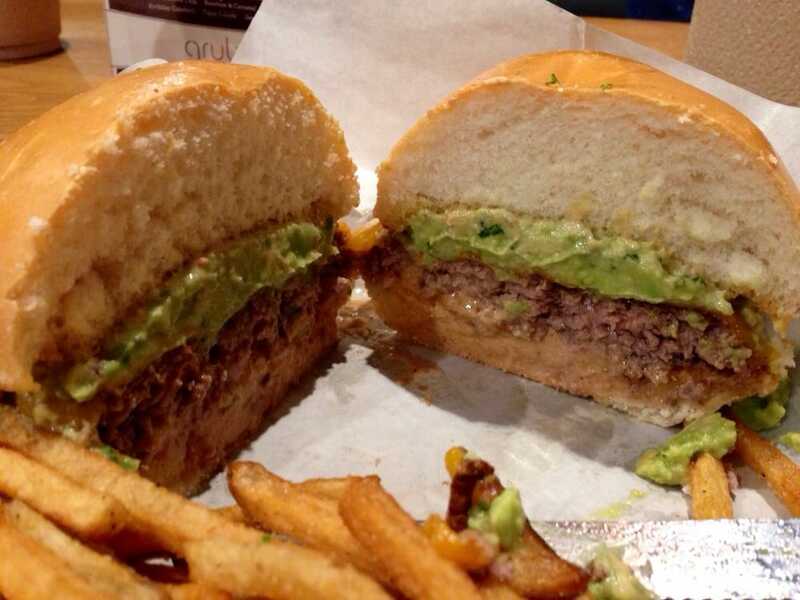 I didn’t even mind the avocado right on top, which is usually a big “no-no” for me. 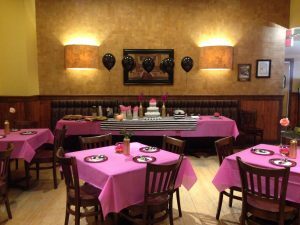 That night, we were too full to really think about food until about 9:15pm when we ordered a bacon calzone crust “The Original” from Picasso’s. Jarryd said that pizza doesn’t quite taste the same in Mexico City, so he slathered on the marinara, ranch and garlic butter before devouring about six slices of pizza. The next day, Sunday, we planned to go to a BBQ joint in Deep Ellum that would only be open from 11am-3pm. We got there at 10:45am and already were 45 minutes deep in the line. Even so, it was totally worth it to stop at the Pecan Lodge. Between the three of us, we got sides of mac ‘n cheese and individual dinner rolls, and then were able to try pork ribs, sausage, pulled pork and the beef brisket. 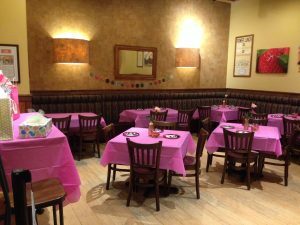 This place was highly rated both in Dallas and nationally, and we did not leave disappointed (or hungry). However, we did manage to find just enough room for a piece of “Smooth Operator” (think French Silk with a pretzel crust) at Emporium Pies, which was conveniently located next door. That night we attended a Mavericks basketball game against Anthony Davis (whoops, I mean the New Orelans Pelicans…after 36 points, it felt like “the Brow” was taking them all on my himself), and Jarryd was such a big fan of Picasso’s that we stopped there again after the game (just plain hamburger this time). All-in-all, it was a great trip, and as I’m sure you can tell, we all left with new exercise, nutrition and weight-loss goals. If you ever find yourself in Dallas for any reason, I’d have no problem recommending any of the food places we visit. Well worth the trip! Baby and I had our 33 week appointment today, so I wanted to give you a little “Bumpdate.” Baby’s heartbeat was around 135 bpm and she was facing head down. 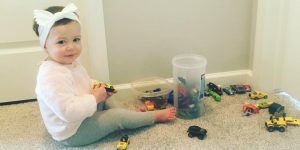 It’s always so fun to see her move around and hear from the doctor what position she’s in, so I know which body part the little jabs and kicks are coming from! The doctor said she wouldn’t be surprised if Baby arrives a little late (which is common for many first-time moms), but I guess we’ll find out more as her due date (1/17/17) gets closer! 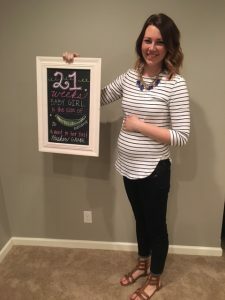 She also estimated that Baby currently weighs around 4 pounds. Little Miss has been moving around a lot lately, and I can feel tiny body parts when she shifts throughout the day. As I’m writing this, she is jabbing me in the ribs which is a little uncomfortable, but I’m always just happy to know she’s active and doing well! She has also been resting or bouncing on my bladder a lot because I feel the urge to go even when I know I don’t need to! Silly little girl! I’ve been very lucky this whole pregnancy as far as pains and symptoms go. The only pain I’ve really been feeling this whole time is hip pain, primarily at night. I think they’re just stretching out as Baby is growing, but sleeping on my sides (which is what’s recommended in pregnancy) causes them to hurt quite a bit! I also seem to be catching every sickness possible from my students! I usually have a great immune system, but I know that most of my antibodies are going to the baby now which is most important! 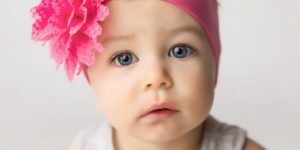 I’m also feeling a little more forgetful than usual, “baby brain,” which I’ve heard is actually a real thing! I mostly find myself searching for common words when I’m teaching or conversing and can’t find the words for what I want to say! 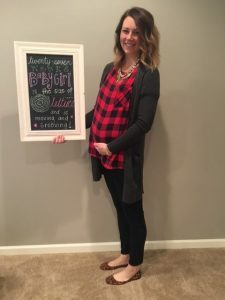 Our next appointment is in 2 weeks, and I’ll try to give another “Bumpdate” then! After that, we start our weekly doctor visits until Baby is here. Can’t believe how close we are to meeting our little girl! 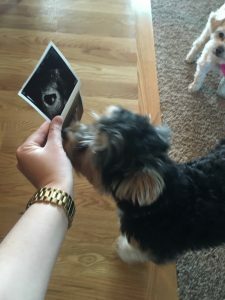 We love her so much already! JCrew Jeans – I bought these side-paneled jeans in rinse wash and black and they have been amazing! 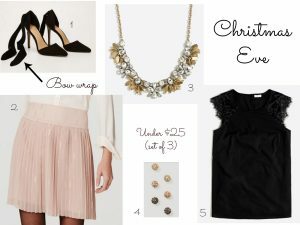 (I have the toothpick style, but I’m linking the matchstick since it looks like mine are out of season) They are super flattering on, and even come in tall sizes (which is hard to find in maternity). The only thing I would caution you on is that they don’t have the full panel for belly coverage, which was actually great early on in my pregnancy but is not as useful the last few months. I would recommend Loft maternity jeans if you’re looking for a full panel. A little bling – I’ve always loved to accessorize, but have fully realized the importance of a great statement necklace or blanket scarf when dressing for two. 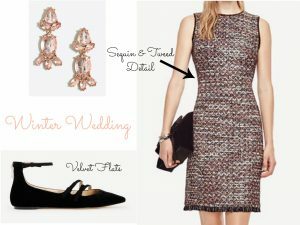 Since you won’t want to buy a whole new wardrobe to wear for just a few months, some great accessories can help you to mix, match and change up those key pieces you’ll be wearing again and again. Gap leggings – These are AMAZING. They have a full panel, are super comfy and great quality. I wear mine to lounge around the house or with a tunic or dress for work. I would recommend investing in both a gray and black pair, especially if you live in a cold-weather climate or are pregnant during the fall/winter. GapFit Tee – Great basic for working out or running errands. I also have a short sleeved tee from this same line, which is also a great basic to have! PinkBlush cardigan – I can’t say enough about this cardigan. It’s amazingly soft and versatile, perfect for lounging around the house or dressing up for a night out. I plan to wear mine into next year as well – I’m not really sure why it’s considered maternity! Blanket scarf – Remember what I said about accessories? Definitely invest in a great scarf if you’re pregnant in the fall or winter! Bonus: you can wear it for years to come, even after that sweet baby is out of your belly and in your arms! PinkBlush tunic – This is a great tunic that I recently purchased, but really any looser fitting tunic is going to be your best friend! They are so cute dressed up with leggings, but you’ll still feel like you’re in your PJ’s! 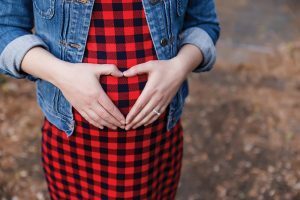 Non-maternity tunics are actually best, so that you can wear them later on as well. P.S. 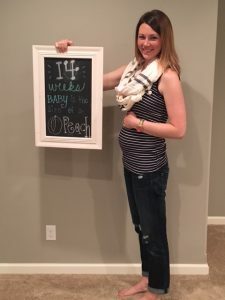 Anything from PinkBlush is pretty great for cute maternity pieces! Gap Tee – My love affair with Gap maternity continues. I tried other stores, but honestly had the most luck with Gap’s stuff. I have this tee in gray, black and white and wear it all the time to layer under a sweater or vest or with a blanket scarf. Lou & Grey Dresses/Tunics – These are a great non-maternity option because of how loose they fit. Perfect with a pair of maternity leggings and flats or boots for fall/winter. Again, great for now, and you can wear again later! 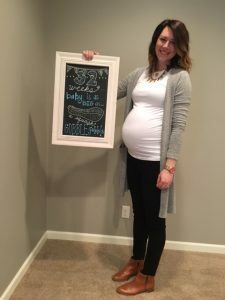 Comfy shoes – I’ve always been about looks over comfort when it comes to shoes, but that has pretty much gone out the window since being pregnant. I look for every opportunity possible to wear my New Balance Fresh Foams, and the black color pairs well with everything! Visit 605 Running Co. if you live in the Sioux Falls area for a personal shoe fitting! I’d love to hear from you! How far along are you? 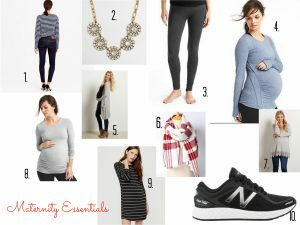 What are some of your maternity essentials?